Hi, Good Morning, Thank you, friends and viewers. Today I will post how to make Hayagriva recipe. Hayagriva or hayagreevam is a sweet dish made with chana dal or bengal gram. We picked it from our far related grandmother. It is said that some of our family ancestors belong to Karnataka and we too have relatives and connections with Madhwas. So she must have picked it from them. A very simple and less time taking dish to make. The maximum time it takes is for soaking chana dal only. We can add coconut and some dry fruits to it, but I did not add anything. Except for some cashew nuts. But I will be giving where to add coconut to it, so anybody who wants to add can add it too. We can make it with jaggery or sugar. To get the authentic Madhwa temple taste, prefer to make it with only jaggery. 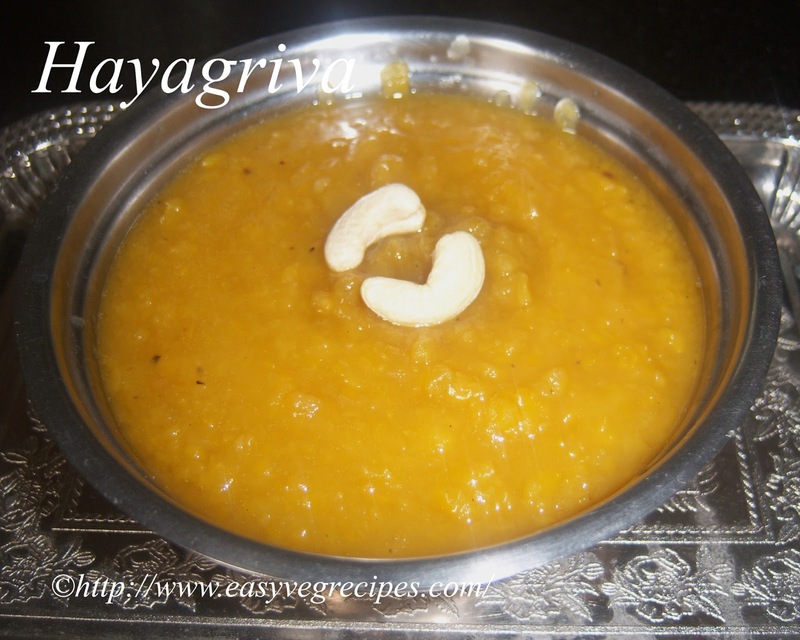 Hayagriva -- Sweet dish made with chana dal. Wash and soak chana dal for eight to ten hours. Pressure cook it for four to six whistles. Heat ghee in a pan, fry cashew nuts, almonds and raisins. Keep it aside. Once the pressure cools down, mash it with a potato masher. Again put it on the low flame, add jaggery and allow it to melt and combines well. Add ghee and allow it to cook till it becomes a single mass. Add coconut, cardamom powder and already fried dry fruits. Mix it well and allow this to cook for two seconds. Thanks a ton for this traditional dish. Most welcome. Thanks for visiting my blog.